I just bought it at Costco today. It was the first cookbook Costco has had in a while worth looking at. I quickly read through the intro and concluded that this is a very accessible book. This is a cookbook for the home baker, written by a home baker who happens to be a professional, if that makes sense. Wow, I'm surprised it was there, Amazon doesn't show it being available until November 1. I wonder how Costco has it already? Does it give gram weight equivalents for all ingredients? I'm sorry, no. Measurements in cups, tablespoons, teaspoons, etc.. Temperatures in degrees Fahrenheit. Towards the back is A Dessert Maker's Glossary of Ingredients, Tools and Techniques. I can tell we think alike, sanrensho. This is my pet peeve: baking and pastry books (cookery books as well) with measurements by volume alone. And, correct me if I'm wrong, it seems to only be relevant in US published cookbooks. The dumbing down of Americans. When will we ever get on the metric bandwagon? I have a question: when American cookbooks are published in other countries, do they convert from volume to weight and add metric equivalents? Very few US cookbooks are re-printed in foreign editions, for many reasons. There appears to be a general view held by editors that if a cookbook is to sell well in the US, the content needs to be "familiar" to the US market. So once the author is persuaded to make the content "very American", it's then very costly to translate that theme into a general book suitable for a world market. As the best strategy is always to choose your market and sell heavily to it, I can't imagine a US publisher being concerned whether they can sell foreign editions or export as the US market is large enough to give an excellent return if you get it right. The appeal of these values dwindle away from America just because the references are very specific to the US. US cookbooks are very heavy on text, which I love, but it becomes very costly to translate. I'm told that anything over 40,000 words per 200 pages gets too costly for many publishers who need to translate the text into another language. Here in the UK, when publishers aim to sell the rights for foreign language editions, this is planned from the beginning. The type design will allow space at the bottom of the page, so languages that run longer (like German) wont affect the design. This is important because the book text is on a separate plate to the four-colour printing, so that each foreign language publisher only has to remake the text plate. Also, in many markets outside the US, heavily illustrated books sell better than text ones. So a publisher will be less inclined to go to the expense and trouble if the sales aren't expected to be good. Design is an issue too. Often the typography is too fussy in a way that doesn't sell well in Europe, but would be very expensive to change. The covers aren't too much of a problem as they are altered easily. And way down the list is volume measurements, like cups and spoons. I believe that the reason editors in the US prefer their use is much more complicated than "nobody in America uses scales". Many readers tell me that they find recipes that use cup and spoon measures "sound easier" and are reassured by its homeliness. There is also the view, expressed by many posters in this forum, that metric is un-American. And they're right, it is. Whereas here in the UK I have the opposite problem. I get emails from readers saying, "well, as soon as I saw '1/2 tsp fresh yeast' in the ingredients I just gave up" or recently "why do you insist [in your newspaper column] measuring butter in spoonfuls?". I'm not sure it's solved by using cups/spoons and grams as it just alienates one or other of the readers. 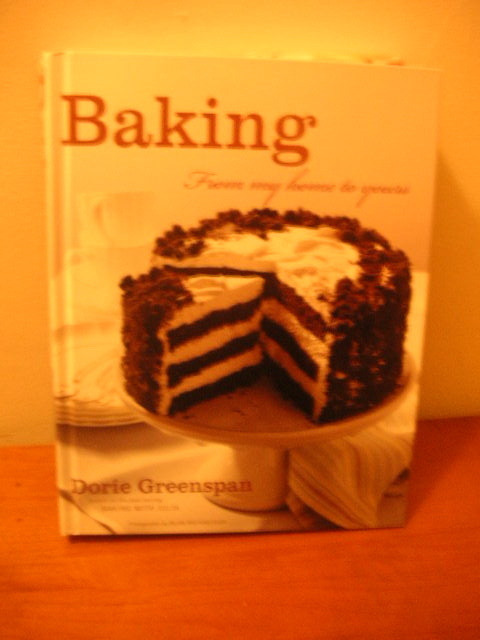 I really like Dorie Greenspan, and will get this one shipped over from Amazon in the US. So Russell, what are the highlights? I totaly agree with you dan about why most american cookbook authors don't think of translating US measurements to Uk, ahuge country= ahuge market. I love american cookbooks because of the heavy text (a lot of details and information) and that makes the book valiable. The cup & spoon measurement are truely easy for the home baker if you lazy to use a scale. But thats makes me nervers when doubling recipes, because many proffetional bakers advised me using the grams measurment in doubling recipes. I wish the japanese pastry masters translate there art in to english one day! US cookbooks are very heavy on text, which I love, but it becomes very costly to translate. I'm told that anything over 40,000 words per 200 pages gets too costly for many publishers who need to translate the text into another language. Here in the UK, when publishers aim to sell the rights for foreign language editions, this is planned from the beginning. there are other perils in translation. "french fry" was published in japanese and polish (???!!!). the japanese publisher sent me some copies of the book. since i don't read japanese, i kept them around as a curiosity. one night at dinner i showed the book to a japanese friend and she started laughing hilariously. i understand that "how to read a french fry" would be hard to translate into another language, but really "rational cooking the macho way"??? You can do it, Russell! Just give us pictures of what you make so we can drool. What kind of recipes? I've heard muffins so far. What other topics does she cover? As I mentioned in the new books for 2006 thread, this really is a terrific book that every baker should jump on. Dorie is an EGulleter...so come on Dorie! Don't be bashful - promote! Its a sure hit, so tell us all about it. Until Dorie arrives, I'll fill in a few details. I bought this book yesterday at Sam's Club. We went grocery shopping immediately afterward, and on the way I had time to look through most of the book. While shopping, I found myself almost drunk with enthusiasm, and having to hold myself back from purchasing a bunch of ingredients. I'm walking a line between wanting to try everything right away, and knowing I have only a certain amount of time, and must pace myself. The recipes are preceded by a descriptive paragraph, often indicating the origin of the recipe, and almost always describing serving suggestions. I also like the "Getting Ready" paragraph that comes after the ingredient list, and at the top of the directions, because I often forget the very important equipment-prep steps that need to be completed and out of the way before combining of the ingredients begins. 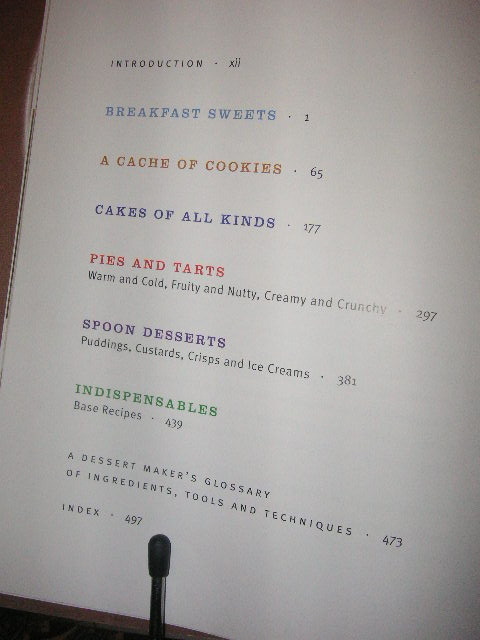 The first section is entitled "Breakfast Sweets." The Carrot-Spice muffins will be perfect to take on an upcoming trip. There are more muffin recipes, plus several biscuit and scone recipes, with a page of discussion for methods to produce flakiness. Then on to Morning Cakes and Loaves, which includes a recipe for Golden Brioche Loaves that I cannot wait to try. The second section, "A Cache of Cookies," includes some that are basics in American cookie baking, and some that are from famous (or nearly) restaurants and shops. There are quite a few brownie recipes, several bar cookie recipes, and many "Side of the Saucer" recipes for cookies that make good accompaniments to beverages. The cake section is followed by the Pies and Tarts section, which starts off with apple and pumpkin recipes. Then I was surprised to see the Lemon Cream recipe from the "Desserts by Pierre Herme" book; surprised because I just purchased that book, this week, for that recipe. (I was rewarded for the Pierre Herme book purchase by its inclusion of a recipe for what's known locally as a Tropez Tart -- a recipe I've been seeking for a long time.) The chapter is wrapped up with plenty of chocolate recipes that I plan to take serious time to study very soon. Next: "Spoon Desserts" -- everything from puddings to ice cream, including a Caramel Pots de Creme recipe (which sounds almost too good to be true), marshmallow recipes, bread pudding, rice pudding, crisps, crumbles, and shortcakes. The ice cream recipes include a burnt sugar ice cream recipe, plus a vanilla ice cream recipe with variations. Finally, "Base Recipes" includes pie and tart dough, pastry cream, ganache, sauces and coulis, candied citrus peel, candied nuts, and then the glossary of tools, ingredients and techniques. 1. Introductory paragraphs that tell delightful stories, that draw the reader into the recipe, and provide a reason for trying it, if the reader didn't already have one. 2. Lots of description of technique that both a beginning baker and and experienced baker would find helpful; I even noted a caveat not to store crisp cookies and soft cookies in the same container -- something that's second nature to a more experienced baker, but may be very important for a beginner to know. It's clear that Dorie cares about her readers and wants her recipes to succeed in their kitchens, and she provides lots of information to help accomplish that end. 3. An excellent variety of recipes. Standards such as Kugelhopf, Madelines, Rugelach, etc. are included. There are quite a vew variations of old favorites, and then some new recipes for things I've never heard of, but will obviously become new favorites in my kitchen. The pictures are to die for. My one criticism: no information about how long I need to lay off this stuff before my next cholesterol test. I guess I'll just have to deal with it. An experienced baker would like this book for its variety of recipes; the beginning baker would benefit from its inclusion of the familiar, and enough information to successfully start branching out into other directions. Thanks, Dorie! I feel like I just won the lottery! I did the best that I can. If I used any flash on the book, it would show up on the photos. FYI, the retail prices are $40.00 USD & $55.00 CDN. I bought it at Costco for $25.00 USD. Transfer the squares to the baking sheet and carefully prick each one twice with a fork, gently pushing the tines through the cookies until they hit the sheet. Why? For texture? I'd rather not disturb the look of the shortbread squares, if possible. Before I forget, Dorie. Congratulations!! I'm enjoying reading through this cookbook. I like the helpful tips and facts, particularly the info on using unsalted butter, even though salted butter is so common in the US. Thank you!! Dorie's Baking with Julia and Paris Sweets are standards for me and no recipe has ever let me down. (And, yes, love those Korovas) If judging by the past, the recipes will be well explained and never let you down. (Not like some other unnamed books by well known bakers I have purchased over the years.) Gotta go get this one. Hey eG, how about an interview with Dorie to promote her new book? Actually, the Korova Cookie recipe is in here ... they're called World Peace Cookies. The name change story in the head-note is charming. It's a fabulous cookbook. I, too, got my copy at Costco last week. Tonight I made the Caramel Crunch Bars. Oh, my! I found out 2 days ago on e-cook books site that "baking from my home to yours" is available now and was published on august!!. Also other new books whcih will be released this month, earlier that AMAZON?? Any one got a clue? Is it true? I'm certainly not Dorie, but I know the answer! Shortbread has such a high butter content, it will rise in the center when baking if you don't prick it to release the steam. Pricking gives you flat even shortbread. WOW!! I'd been off line for about a week or so and had no idea that you had started this thread. THANK YOU!!!! Thank you for your enthusiasm, your generosity and your kind wishes. I'm very excited about this book and your encouragement mean so great, great deal to me. Thank you Nina for correctly answering the question about pricking the shortbread cookies. Shortbread needs those little steam holes to bake evenly. It's funny, I can understand why you wouldn't want to disturb the geometry of the cookies, but I never thought of the prick holes as a disturbance -- to me, they were the sign of traditional shortbread. I was able to include metric weights in the second PH book, Chocolate Desserts by Pierre Herme, and in Paris Sweets, primarily because the recipes were originally French and in metric and there was some hope that the books would be published in France -- Chocolate was, Paris Sweets wasn't. In general, I think publishers are loathe to include metric in books that, like my new baking book, are meant for home bakers. It's a pretty complex issue and I think Dan Lepard got it right in his post. Dan's post is also interesting on the topic of American books being published abroad. I was very disappointed when Paris Sweets didn't find a French publisher because all the Parisian pastry chefs who had given me recipes were so generous, I had hoped they'd be able to have a version of the book they could enjoy. It was almost published. I had one publisher who was very interested and we met a few times before she finally turned it down saying: "I don't think we can publish a book in which an American tells French people about their own food." And speaking of translations, Russ -- I'm sorry to hear what happened with your Japanese edition, but it's a great story! It's also the reason I've never read the French versions of the Pierre books -- I'm sure I'd find lines just like that one! Location:Florida and New York, depending on the weather! I just RAN ( ok, I had hubby drive me) to Price Club in Westbury and purchased this glorious book. I got the same warm and fuzzy feeling when I read my first Maida Heatter cookbook many years ago. Beautifully written, with sumptuous looking photos, just perusing this book flooded me with childhood memories. Ms. Greenspan delighted me with her Apple-Pie cake story. Funny and tender (no pun intended). I will be making this as one of my desserts on Rosh Hashonah. Like Dorie's grandmother, I have always made my Russian Apple Cake with oil. Keeping that glorious light green box in mind, I will also be making the Devil's Food White Out Cake. YUM!!! 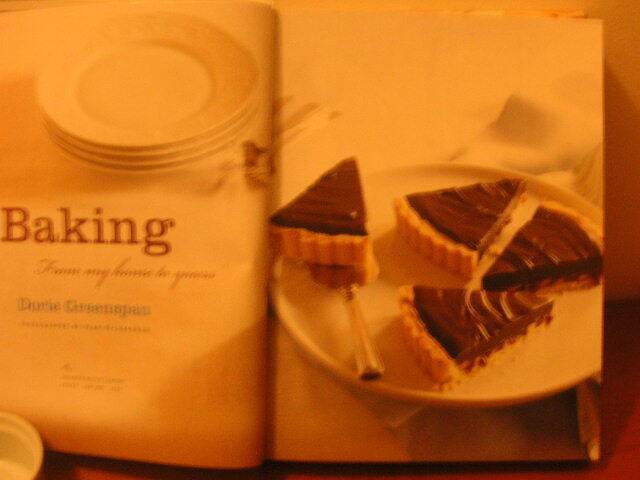 Felice, Patrick S and I invite you to join us in Baking with Baking: From my home to yours by Dorie Greenspan. This thread is the place to include your notes and share with us photos of recipes you have prepared from it. It is also the place where Dorie will check in often and provide her insights and tips about baking from this lovely book. Dorie will be joining us for an eG Spotlight Conversation in November as well. That would be the perfect place to ask all you want to know about how she came to baking and to work with Julia Child, Pierre Herme and Daniel Boulud or any other question related to her career and body of work. Baking: From my home to yours. The title says it all, this is a book filled with 300 recipes created for the home baker, recipes that use simple, easy to find and use ingredients and few expensive tools. Dorie applies the lessons from three decades of experience to discuss a subject very dear to her: Home Baking. This experience means that the recipes are far ranging, from a simple spicy muffin to a decadent dramatic black and white cake for a special occasion to Pierre Herme’s luscious lemon tart. Dorie has written or co-written eight previous books including four with masters: Baking with Julia with Julia Child, Desserts by Pierre Herme, Chocolate Desserts by Pierre Herme and Daniel Boulud's Cafe Boulud Cookbook. 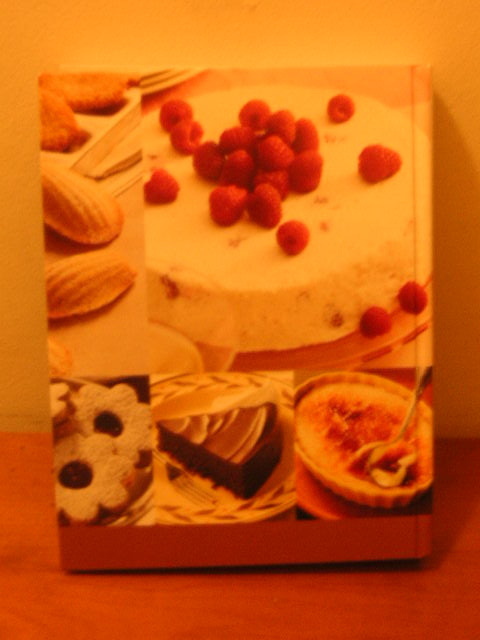 Another of her books is the wonderful Paris Sweets: Great Desserts from the City's Best Pastry Shops. Baking: from my home to yours for general discussion and comments on the book. Cooking with Chocolate Desserts by Pierre Herme. In preparation for the upcoming November eG Spotlight Conversation with Dorie Greenspan, we started a thread dedicated to baking recipes from her new book "Baking: From my Home to Yours". Like the Baking from Chocolates by Pierre Herme thread, let's use this new thread to share our latest baking experiences, successes and problems from this new book. Dorie will check in often to share her tips, hints and insights. Thank you so much to "rjwong" for starting this thread and alerting us to the earlier than expected release of the Baking book. Just a note that the book doesn't seem to be available in Canada yet. (no go at Costco). I do have a copy on order though - and I'll head over to the other topic once I get it. I can't wait to start trying some of recipes and to see what everybody else is baking with it. Yay I got this too! Looking forward to discussion/cooking. I have had better luck with first editions at Costco than pre-ordering at Amazon, I swear -- ran in for a wild sockeye filet, emerged with the new Dorie Greenspan (as well as the salmon). However, I agree with Russell that Costco's cookbook range ain't what it used to be. Maybe this signals a renewed emphasis. I'm in Canada too. I can't wait to get my hands on this book. I have it on order at Chapters, but if you find it somewhere else first, please post about it. I know we're going to move over to the new thread, but I just wanted to post this here. I just received an e-mail from a reader pointing out a typo in the Russian Grandmother's Apple-Pie Cake. The pan size should be 9-x-13 inches (not 9-x-12). I hope ApronStrings see this. As it turns out, the cake is very forgiving and it would be fine in any pan that comes close to 9-x-13. The difference in a slightly smaller pan would be thicker layers and the need for a little more time in the oven.